A trip on the subway would cost many riders an extra 30 cents, bus fares would climb 25 cents, and some commuter rail tickets could exceed $10 for the first time, under a budget-balancing plan announced Wednesday by the MBTA. Widespread service cuts were largely avoided, but weekend service would vanish on three commuter rail lines - two on the South Shore - and four bus routes would be eliminated. That news frustrated many riders, but brought relief for others who had braced for the steeper increases and harsh service cuts floated by transportation officials in recent months. Those more drastic measures were vociferously criticized at hearings across Greater Boston. The new plan, which could be approved by the T board next week, would take effect July 1 and avoid most of the threatened service cuts. But it is just a one-year fix, made possible in large part by raiding a little-known reserve not intended for transit. Even that rescue is not a sure thing: Legislators must approve taking money from the account. State officials cautioned that riders should expect more pain next year, barring a new tax to alleviate the MBTA debt. The state must also contend with a highway program operating in the red and threadbare regional bus systems. “We have a broken transportation system,’’ Governor Deval Patrick told reporters gathered outside his State House office Wednesday, describing the “patches and plugs’’ that would help the T at least rattle through the 2013 budget year. “This is neither a permanent nor a comprehensive solution,’’ he said. Subway riders with CharlieCards would pay $2, an 18 percent increase, while bus riders using the prepaid card would pay $1.50, a 20 percent hike. A bus-subway LinkPass would rise to $70 a month, from $59. Most one-way tickets and monthly passes on the suburban commuter rail would rise 20 to 30 percent, with single tickets ranging from $2 to $10.50 and monthly passes from $70 to $329. Seniors who now pay about a third of regular subway or bus fares would see that discount substantially shrink. “Whoa! That’s horrible!’’ said Dee-Dee Arnold, a Dorchester grandmother awaiting the Red Line at Park Street Wednesday. Her 60 cent one-way ride on the subway would climb to $1, requiring $300 more a year. “Guess I’ll be going a lot less places,’’ she said. Those relying on The Ride, the federally mandated door-to-door service for the disabled, would see fares double from $2 to $4 for most trips and rise to $5 for rides in outlying suburbs, deemed a premium area. “Who are they kidding, doubling the price of The Ride?’’ said Pam McLaughlin, 71, who uses the service daily to look after her grandson, run errands, attend Mass, and write occasional columns for a local newspaper. The Somerville woman said she contracted polio as a child and drove a car with hand controls until a fall left her unable to get in and out of the car alone, leading her to The Ride. “I’m livid,’’ she said. Secretary of Transportation Richard A. Davey said MBTA management tried to balance the needs of riders against the stark fiscal realities of the transit agency, taking into account the views expressed at 30 public hearings and in 6,000 e-mails. Financial pressure on the T has been mounting since 2000, when lawmakers made the agency balance its own books instead of sending a bill to Beacon Hill each year. To help, lawmakers gave the T one cent out of every five collected from the sales tax, but bundled it with billions in debt to pay off politically popular expansion projects, some of them required under federal law to offset the environmental impacts of the Big Dig. That plan made the T more efficient; in the past 12 years, it has squeezed more money from advertising and expanded service while reducing staffing. But revenue from the sales tax has lagged because of the recession and online shopping, while many of the T’s costs - debt payments, electricity, fuel, The Ride, employee health insurance - have soared. Just to maintain the status quo for the coming year, the T would need an extra $185 million. By January, officials had whittled the projected deficit to $160 million before proposing substantial service cuts coupled with price increases of 35 percent or more. Transit advocates, environmentalists, business groups, and riders railed against those plans, which officials softened by finding $61 million in one-time sources, the very last “rabbits out of the hat,’’ Davey said. That includes $5 million remaining for snow removal after a mild winter, $5 million from a better-than-expected deal to lease the North Station parking garage, and $51 million from a fund paid by motor-vehicle inspection fees. That fund has a surplus remaining after paying to modernize inspections. The remaining money will come from fare increases, worth $73 million, plus $15 million in cuts. The T plans to eliminate four of nearly 200 bus routes and reduce runs on 14. It will also eliminate weekend service on the Greenbush, Plymouth/Kingston, and Needham lines. But the T will largely preserve threatened ferry service and E Line service on the Green Line. Instead of stopping weekend service on that trolley branch altogether, trains will run as far as Brigham Circle, but no farther, allowing riders to reach the Longwood Medical Area and art museums. Ferry tickets will be raised 35 percent, and the weekend Quincy boat will be eliminated, with the goal of keeping ferries running but eliminating their subsidy, Davey said. Some advocates said the T’s plan to raise prices an average of 23 percent seems favorable only against the bleaker proposals that have been scrapped. “This is like jumping off a cliff,’’ said Kristina Egan, executive director of Transportation for Massachusetts, a coalition of planning, transportation, housing, health, and environmental groups that have advocated for modest, predictable fare increases and a sustainable long-term finance plan. Other transit agencies have diversified incomes that include local payroll taxes and taxi surcharges. 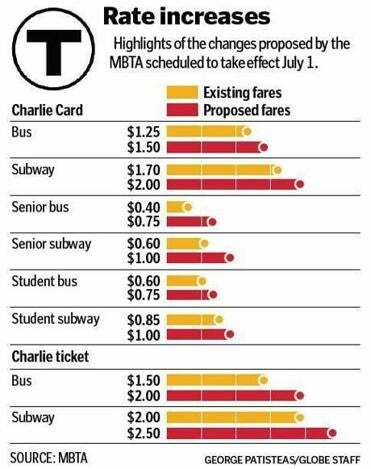 The T fare increase would be the first since 2007. Compared to many states, Massachusetts has an extensive transit and highway system, but one it struggles to operate and maintain, having approved decades worth of construction without dedicated funding sources. Though the T’s woes have received more recent attention, the highway system is little better off. Reluctance to raise tolls and gas taxes means basic upkeep such as mowing and striping is paid with borrowed funds. Patrick said a new tax for transportation would “have to be at the top of our agenda next year’’ but declined to offer specifics, noting lawmakers rejected his attempt to raise the gas tax in 2009. “They’re going to have to be receptive to something,’’ he said. Straus said legislative approval of taking $51 million from the inspection fund for the T may not be assured. The Mattapoisett Democrat said money paid by drivers across the state should support not just the T but also ailing bus systems in cities such as New Bedford and Springfield. Senator Thomas M. McGee, Straus’s Senate counterpart, said he thought T management “did a good job under trying circumstances’’ to close this year’s gap. Noah Bierman of the Globe staff contributed to this report. Eric Moskowitz can be reached at emoskowitz@globe.com. Follow him on Twitter @GlobeMoskowitz.